Incorporating self-seeding species in your flower garden is one approach to creating a beautiful, low maintenance landscape. Most flowers do not spread themselves on their own, but certain species germinate so easily that they spread to form a natural meadow and renew themselves year after year so you never have to replant. 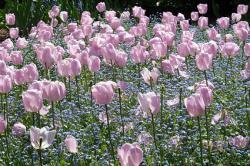 Establishing a self-seeding flower garden is primarily a matter of using the correct species. What self-seeds in one area does not always self-seed in other areas, but there are many plants that self-seed in a wide range of climates, which are listed below. There are two options for getting started. You can plant seedlings from a nursery and allow them to set their seed and spread on their own, which costs more up front, but provides more immediate results. Or, you can start the plants by broadcasting seed in the desired area. Either of these approaches can be carried out in spring or fall though some plants prefer to be sown at one time or the other. Clear the existing vegetation and loosen the soil with a digging fork or tiller. Scatter the seeds randomly according to the rates indicated on the package (usually given in ounces per 100 or 1000 square feet). You can mix different varieties of seeds together if you like. Cover the seeds with soil to a depth about twice the diameter of the seed and then water thoroughly. Don't cover the seeds with hay or other mulch like you might when planting grass seed. Hay often contains weed seed, which will compete with your flower seeds. After they germinate, cultivate with a hoe to remove any unwanted weeds that also come up. The following flowers are among the easiest to establish in a self-seeding garden. To ensure that a plant will self seed, use open pollinated or heirloom varieties of the plants. Hybrid selections do not grow true from seed. Self seeders can be considered hardy in all USDA zones because they perpetuate themselves by seed even if cold weather kills the plants each year. In the coldest climates, however, all of these should be sown in spring. Because the weather is mild in the fall, it's a good time for planting. Since temperatures are cooler, less irrigation will be necessary. However this only works with plants that thrive in cool weather. Many of the most popular self-seeders for fall are wildflowers. 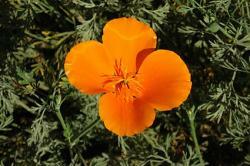 California Poppy (Eschscholzia californica) has bright orange flowers and finely cut grey foliage about 12 inches tall. It blooms summer through early fall. Sweet Alyssum (Lobularia maritima) has honey-scented white blooms and forms an extensive carpet around taller flowers. See it blooming spring through early summer. Red Garden Poppy (Papaver somniferum ) grows on thin stalks to three feet tall and has carmine-colored flowers and decorative seed heads. This poppy blooms in spring. 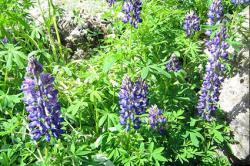 Lupines (Lupinus spp.) come in a rainbow of colors and a range of sizes, but all share the came conical flower stalk and bloom in summer. Forget-Me-Not (Myosotis sylvatica) forms a low mat of sky blue flowers. Expect spring blooms. Love-In-a-Mist (Nigella spp.) grows into a two-foot tall tangle of multi-colored blooms and lacy foliage. It blooms in spring and early summer. Larkspur (Consolida spp.) is an upright grower to two or three feet with flower stalks in shades of blue, purple, and white. See its blooms in spring and summer. Some flowers require the warmth of spring to germinate and like to put on their show in the heat of summer. Marigolds (Tagetes spp.) 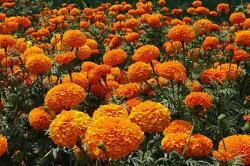 are short, erect plants with ruffly orange and yellow blossoms. They bloom in summer. Zinnias (Zinnia spp.) 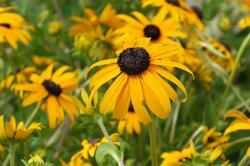 come in a range of warm colors and have daisy-like flowers on bushy foot-tall plants. Zinnias bloom in summer and early fall. Nasturtiums (Tropaeolum majus) are vine-like plants with orange flowers that can be left to form a groundcover or trained up a trellis. Enjoy blooms in spring and early summer. Cosmos (Cosmos spp.) are prolific self-seeders that grow up to three feet tall and come in a wide range of colors. Find blooms in summer and early fall. Cleome (Cleome spp.) grows up to four feet tall and has unusual pink and white spider-like blossoms. Cleome blooms in summer. Black-Eyed Susans (Rudbeckia hirta) are a sunny addition to the wildflower border with their yellow blossoms held two feet above low clumps of foliage. You will see blooms in summer and early fall. Sunflowers (Helianthus annuum) range from two-foot dwarf varieties to 10-foot giants, all of which are capable of seeding themselves. They bloom in summer. Other than weeding and providing irrigation during times of drought, there is little maintenance needed for a self-seeding flower garden -- that would defeat the purpose. 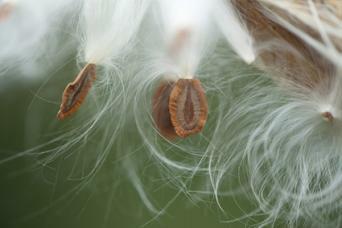 There is one thing to make sure not to do, however: don't cut off the seed heads. Leaving flowers to go to seed and drop their seeds back in the soil is what allows them to produce new plants the following year. Every spring or fall, depending on the variety, the seedlings of a self-seeded flower garden will come up all on their own. In this way you'll have a self-perpetuating flower garden for years to come.